LAU’s Cisco Academy Training Center receives an award for Best Outstanding Contribution during a two-day conference in Byblos. 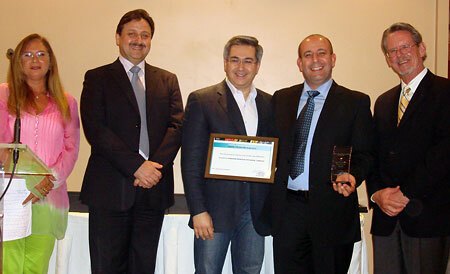 Bassam Moujabber (2nd from right), acting director of LAU's Cisco Academy Training Center, receives the Cisco Networking Academy 2009–2010 Best Outstanding Contribution Award, during the Arabian Adventure Roadshow Conference at LAU Byblos. Dr. Houda Baraka, first deputy to the minister of Communications and Information in Egypt, talks about the role of technology in the development of her country, during the LAU conference. Titled "Education Means Development," the annual conference gathered Cisco trainers, managers and administrators for a series of presentations over two days. Conference participants gather for a photo. 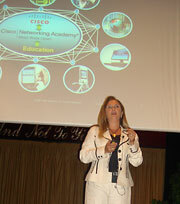 LAU’s Cisco Academy Training Center received the 2009-2010 Best Outstanding Contribution Award from the Cisco Networking Academy on April 18 during a two-day regional conference at LAU Byblos that brought together over 100 information and communication technology specialists from across the Arab world. 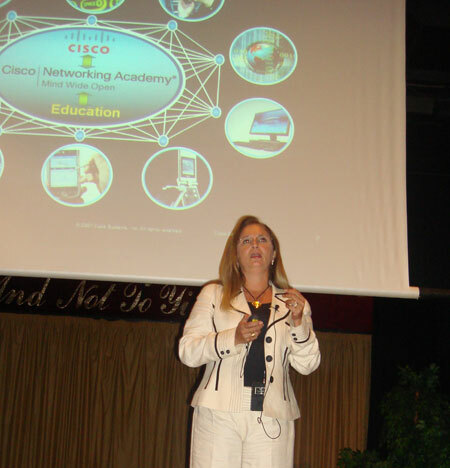 The training center was chosen for the award among over 700 Cisco academies spanning from Morocco to Afghanistan that were nominated to receive any one of 11 distinguished awards. LAU’s Cisco academy operates on three levels: locally, where it offers courses to college students; regionally, where it deals with curricula and instructor training; and lastly, it serves as an academy training center to train the trainers of regional academies. This year, the academy hosted the two-day (April 17-18) Arabian Adventure Roadshow 2 Conference in collaboration with California-based IT giant Cisco Systems. The annual conference is held in a different location each year. Titled “Education Means Development,” the event gathered Cisco trainers, managers and administrators for a series of presentations focusing on networking, creating sustainable academy communities, and enhancing ICT education. “The main aim of the conference was to understand where curriculum is going,” Moujabber says. He explains that educators must learn to constantly adapt to new innovations in the ever-changing world of technology. LAU’s Cisco center, Moujabber adds, stands at the forefront of ICT innovation in the region through its beta testing of curriculum and applications. 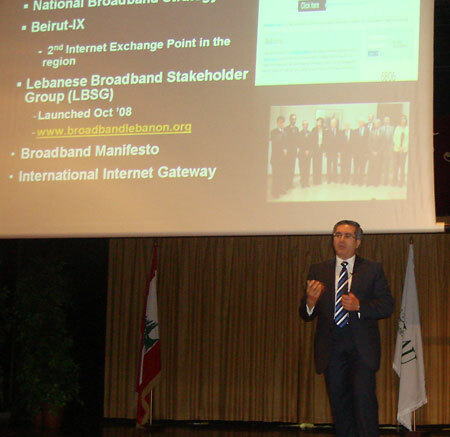 Fadi Moubarak, Cisco general manager for the Levant region, gave an address during the conference, where he predicted that in 10 years, the world will be looking at the Middle East as a leader in educational development. Dr. Houda Baraka, first deputy to the minister of Communications and Information in Egypt, gave a presentation on the evolution of education in Egypt over the decades from traditional one-on-one tutoring in the ’70s, to the industry age in the ’80s, followed by the internet age in the ’90s, and finally how social networking websites are being used for learning.